Last night SFUR and SFRPD held the second Community Design Meeting at John McLaren School just across from the proposed bike park site. 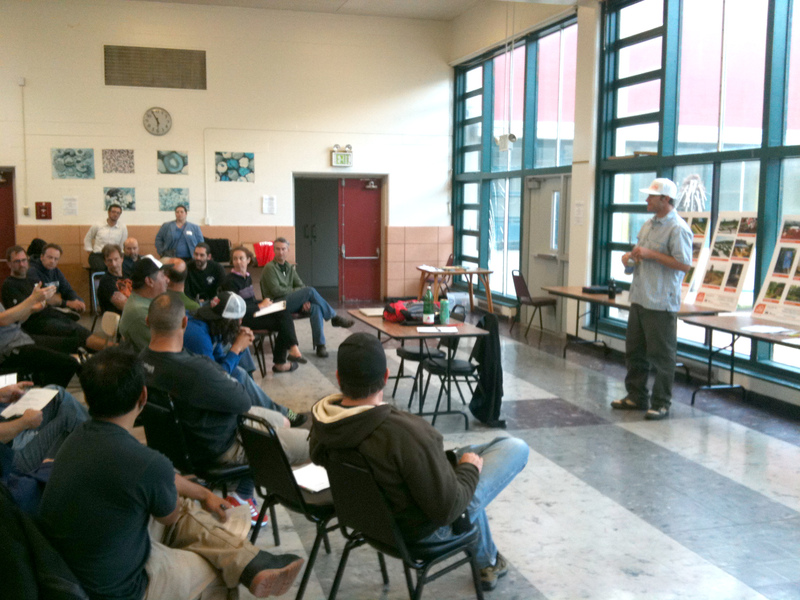 Many of the same faces from Design Meeting #1 were there to continue to help design San Francisco’s first bike park. After introductions from Alex Randolph, SFRPD, and a brief description of where were are in the process from SFUR’s Dan Schneider and Dustin Smith, Alpine Bike Parks’ Judd de Vall took attendees through photos of various bike park features that were suggested in Design Meeting #1 as well as a few thoughts on how to effectively integrate BMX features into a predominately dirt park. After much productive discussion, we moved into comparison/contrast of the three conceptual bike park layouts that Alpine had created. Concepts A and B had a similar overall layout with a secondary start hill dividing a L/XL slopestyle section of the park from a more intermediate and beginner section. Concept C eliminated that separation and unified the entire slopestyle area. There was much discussion around this main structure of the park, but the consensus was to keep the two areas separate for a few reasons: 1. It’s safer to keep levels of experience a bit separate from one another. 2. Two slopestyle sections will allow for variety and more berms and turns vs. a few long trails all the way down the hill. Most attendees preferred the option of a single slalom course and short track DH option in option B, to more Freeride trails in option A. How many pumptracks, placement and level of difficulty was another primary discussion. Almost unanimously, a small kid pumptrack and/or roller area was preferred to a flat space for kids to learn how to ride. All felt that could be done in a parking lot or tennis court. Rolling features may be incorporated into a youth pumptrack toward the bottom of the park in the revised design. A more expert level pumptrack may be incorporated into the XL Slopestyle course. There was a lot of discussion around this as everyone wants at least 2 pumptracks, but doesn’t want to give up too much space in the plan to get them. We all look forward to Alpine’s proposed solution in the next meeting. Everyone attending the meeting was given a few minutes to talk about their personal style of riding and what each would want in the park. That’s a big perk of showing up. You will be heard. And you will play a real and tangible role in the design of this park. Sharon Hewitt from the Sunndyale neighborhood, and project manager for CLAER (Community Leadership Academy Emergency Response) stopped by to talk to the group for a few minutes as well. She told some heartening stories about past gang violence in the neighborhood and offered her help with the park in whatever ways are needed. Her request was that we all work together to further the development of this great city and help stop the violence that plagues the Sunnydale neighborhood. 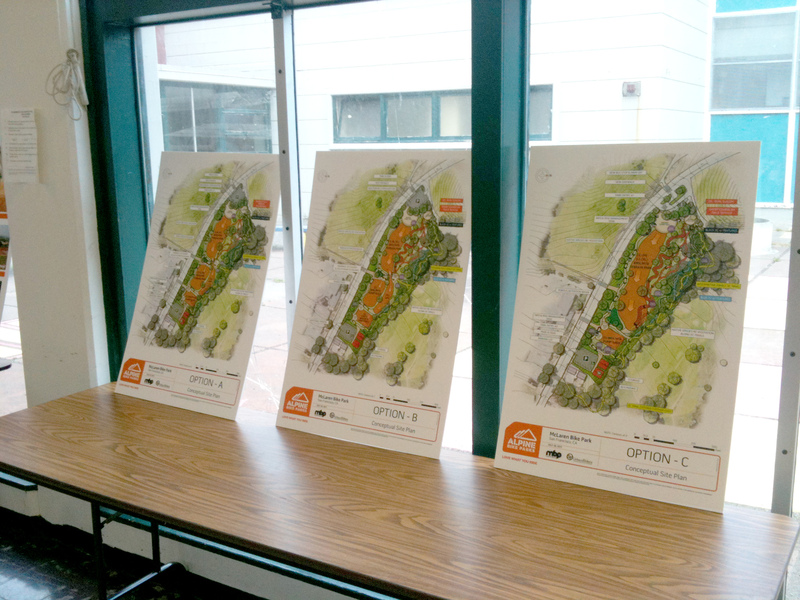 SFUR feels that a bike park will help to more integrate all demographics of the city. Two wheels can unite any two people. The next step is for Alpine to incorporate feedback from Meeting #2 and comments on the design options into one conceptual park design. In the next round we will see more actual features incorporated into the open sections of the current concept plans which focus on the flow and layout of the park. Look for details on MBP Design Meeting #3 to come. The tentative date is September 1st from 6:30 to 8pm. Location may be the same, but please check back for details. Thanks so so so so much to everyone that came and played a part in the meeting. we should have a motocross track somewhere in mclaren i mean there are tons of places to ride a bmx bike or even trail ride there but nowhere closeer than livermoore is a moto track.. i know its the wrong blog to look for support but why not i support your bmx park, where’s the love lol.. I think you’ll find plenty of folks that ride mountain bikes ride dirtbikes and/or are fans of motocross. But, advocating for a mx track in McLaren Park or in the city at all would be huge uphill battle. The potential noise, smell and damage from motorcycles in a sensitive environmental city like SF is never going to fly. There’s a big difference between gas powered and human powered. There are actually no designated off-road areas to ride a bmx or mountain bikes in the city. There are a few multi-use trails on Mt. Sutro, and other trails that are not signed to officially eliminate bikes, but that’s about it. If you know of any, please let us know. Thanks. Please let me know, I would love to get involved and I have a website that I can pump it up as well and a bunch of shred-ready friends. Thank you for all your hard work on the bike park! the proposals look great so far. i would really like to be at the meetings, but i work saturdays and it is very difficult to schedule them off due to staffing issues. as a BMX racer it is great to hear about the pump tracks! if you could keep in mind to include one or two other runs that would be friendly to non-suspension bikes that would be greatly appreciated. doh- missed the link for the 3 proposals. scratch my earlier request. like options A & B for their separation of skill levels. Altho i notice at pleasanton BMX park the non-separation doesn’t tend to be an issue… but then i’ve never been there when it’s been really crowded. Like that B has a course for our dual slalom friends. love that all options have the family XC trail! i printed these out and put them up at work- i’m stoked!! So great to hear that Sharon Hewitt stopped by. She is a remarkable women and a key bridge to making certain youth from Visitation Valley and Sunnydale are part of this process and are benefiting form the bike park.. after all it is their backyard.